That might seem like a subtle difference to some outsiders, especially since agency trading desks fundamentally buy audiences on open exchanges and in private market deals by using data and technology, but it is another in an ongoing shift from buying media to buying audiences on Madison Avenue. Overall, WPP reported strong earnings for the second quarter, despite the fact that the global ad economy experienced a significant slowdown during the quarter. WPP attributed much of its growth to its media investment units, especially GroupM, and emphasized its efforts to integrate technology and improve “shared service centers” across its organization. A good example of that is the role Xaxis is increasingly playing as the clearinghouse for programmatic audience-buying. “In the programmatic realm (where a lot of investor attention has shifted to the agencies' roles) WPP sees Xaxis as more an ‘audience buying model’ than a ‘trading desk’ and expects it to continue being an increasingly important part of GroupM as it is applied more deeply within the overall business,” Dan Salmon, an analyst who follows WPP for BMO Capital Markets, wrote in a report to investors analyzing WPP’s second quarter results. In fact, the report included a graphic (below) recapping WPP’s major milestones through the first eight months of 2014. Half of them were explicitly about Xaxis, including WPP’s decision in April to begin reporting its programmatic revenue on a gross basis. While that also seems like a subtle change, it signals the increasing importance programmatic audience buying has on WPP’s bottom line. It’s also causing some Wall Street analysts to scratch their heads on precisely what that bottom line is. “Assessing exactly how WPP fared vs. these figures is difficult as they -- uniquely among its peers -- break out gross revenue and net revenue separately and regularly,” Pivotal Research Group’s Brian Wieser wrote in his assessment of WPP’s second quarter earnings. 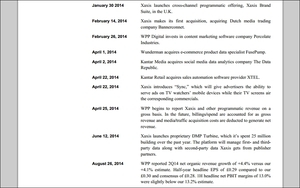 1 comment about "WPP: Xaxis Less 'Trading Desk,' More 'Audience Buying Model'". dorothy higgins from Mediabrands WW, August 27, 2014 at 10:24 a.m.